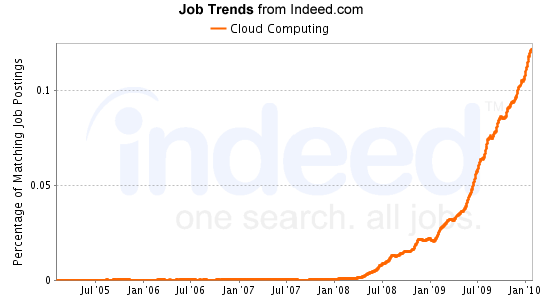 Home > Cloud Computing	> What’s Hot in the Virtualization Job Market? While asked how each Spring products are used in the market at the end of today’s training, the instructor showed us a nice website as a reference. 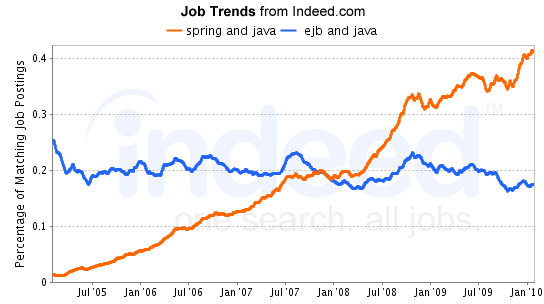 Here is the diagram showing the numbers of jobs requiring skills of Spring and EJB. A great answer even though not a direct answer. Strictly speaking, the jobs are not products, but well reflect what products are in use. So this is a good index on market shares of different products. If you have your products too easy to use, this index works against you. 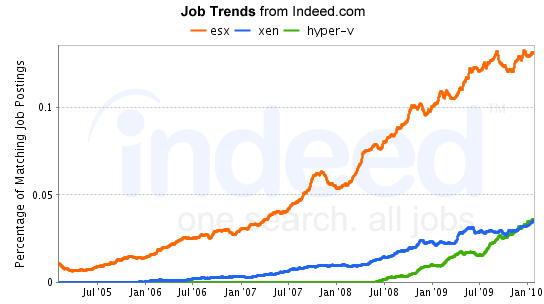 Following that, Let’s check ESX, XEN and Hyper-V to see how related jobs compare with each other. Here is the diagram. ESX is way above either Hyper-V and XEN. Now it’s clear what directions to go. 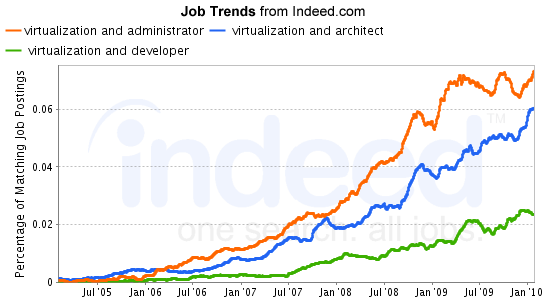 Let’s look at what specific categories of jobs are in demand there: administrators, architects, or developers? As you can see, the jobs or populations of both the administrators and architects are more than double of that of developers. My next book should target system administrators and architects as well. The top 10 trendy keywords at Indeed.com are: Twitter, Cloud Computing, iPhone, Facebook, Corporate Social Responsibility, Blogger Pediatrician, Hospitalist, Social Media, Speech Language Pathologist. Most of these are not related to virtualization itself or even IT. If you want to build up from your current skill sets, cloud computing is definitely the best choice becuase the tranistion should be smoothier than to any others in the list. I will blog about essential skills for cloud computing professionals later. Stay tuned. Good to see demand continue to rise. But this will also mean more people continue to flock to virt just like they did with MCSE in the past. True. We still have cloud admin/architect/developers as our next move. As IT professionals, we have to keep learning all the time.